Arsonists have caused damage estimated at £10,000 at a school being rebuilt after a previous deliberate blaze. Fire broke out in a temporary classroom at Avon Valley School in Rugby, Warwickshire, during the early hours. Police say thieves broke into the classroom and took five computers before deliberately starting the fire. 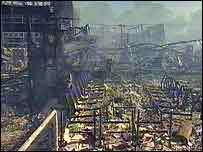 The school was destroyed by a deliberate fire in June 2004. A £17.7m rebuilding project has begun and is expected to be finished in 2007. No-one has been charged over the first fire. Police are examining the scene of the latest blaze and are asking for anyone who saw anything suspicious at the school during Sunday night or the early hours of Monday to contact them.